Every once in a while it's a good idea to try making something that initially doesn't seem very accessible. I live off a little high street that has a fishmonger, a butcher and a cheese shop. Needless to say I'm eating a lot of incredible cheese, and buying a few interesting cuts and fillets. A few weeks ago I was taken by lamb shanks in the butcher, happily carried them home and then realized that I had no idea what to do with them. I figured since they were a slow-cooker meat, i would do the normal sear and then braise in stock. I thought I would try for a lemony flavor and had potatoes to throw in as well. It all went really well, except that I had to bung the shanks in the oven, after the initial sear in the pan, in order to get a good all over caramelization. I think in retrospect, I would have left out the potatoes and spooned this over some very cheesy polenta. 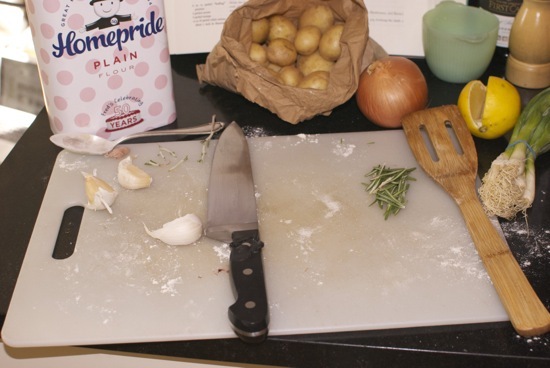 The potatoes didn't brown as much as I would have liked, and the sauce from this is worth a side dish that soaks it up. Coat the shanks lightly with flour. You can start by searing them in a dutch oven with very hot oil, but I think it would be easier to just put them in a very very hot oven for 15 minutes, so that the outside is crisped and caramelized. Remove the lamb and set aside on a plate. Add the onion and the garlic to the dutch oven. Sautee on low heat for 10 minutes. Add the broth and wine and rosemary and scrape up all the brown goodness on the bottom of the pan. 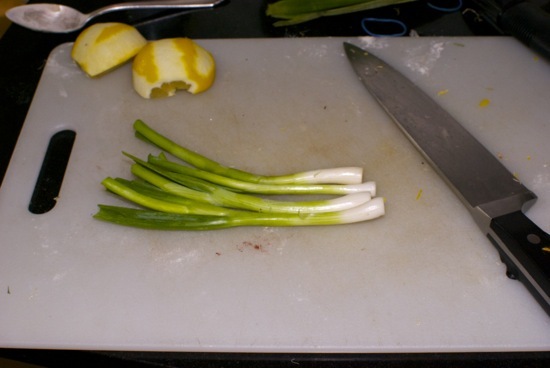 Add the lemons and scallions and bring to a low boil for 5 minutes. Finally slide in the potatoes and the lamb shanks. Cover and place in an oven at 250F for 2 hours. 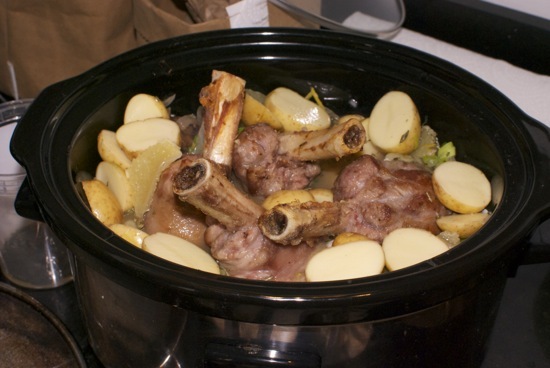 You can also place everything in a slow cooker put on high for 4 hours.